A legislative committee has voted to reject new academic science standards in Oklahoma schools apparently because they refer to the topics of weather and climate in early grades. Weather and climate issues are the last things we need students to study in a place like Oklahoma, right? 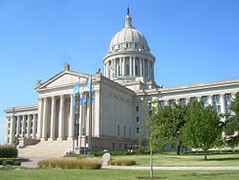 According to the Oklahoma Science Teachers Association (OSTA), “A rejection of proposed education standards by the legislature is unprecedented and at this point the real impact and implications are unknown.” The rejection of the standards, contained in House Joint Resolution 1099, would still need to be approved by the full House, Senate and then signed into law by Gov. Mary Fallin. The House Administrative Rules and Government Oversight Committee voted Monday to disapprove new rules that would create the new science standards, which had been already approved by the State Board of Education. Climate change is not “very much in dispute among . . . academics.” The vast majority of scientists concur that climate change is a reality and a growing concern for the planet. It’s only in dispute by conservative politicians and right-wing media outlets. The new standards were developed using Next Generation Science Standards (NGSS), developed by 26 states and science organizations, as a resource and this also appears to be a sticking point with committee members, according to OSTA. Those who favor the new standards argue they don’t deal with causes of climate change in earlier grades and merely encourage students to make their own critical inquiries into the topic. All this much ado about nothing and political posturing comes right after two major scientific studies (here and here) have been released detailing the very real threat of global warming on the planet. Let’s be clear: Global warming fueled by manmade carbon emissions is wreaking havoc on the planet already and threatens to do much more damage in decades to come. The new and much-needed science standards are not about some type of climate-change indoctrination, which is, after all, a faux right-wing conspiracy theory in the first place. It’s about teaching facts and the latest research on important scientific issues and allowing students to make their own academic investigations. The committee’s decision to reject the new standards is a crass political move that could keep our young students ignorant about the world in which they live. Both OSTA and Oklahomans for Excellence in Science Education have issued political action statements about the committee’s vote.